Not only have we improved our control arms but we took it a step further and even improved the packaging and box design! Our control arms are even lighter weighing in at 1 lb. less than the previous version. The structure and integrity of the arm is as durable as the predecessor’s but is also much more appealing to the eye. This version includes 2 individual mounting points for rear endlinks which allow for even more aftermarket adjustability! Our version 3.1 control arms are now available for the 08+ Subaru WRX/STI and Subaru BRZ/Scion FRS. 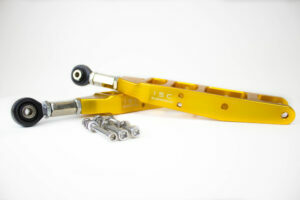 We recommend these control arms for anyone with an 08+ who is lowering their vehicle on coilovers or lowering springs. Our control arms are 6 times stronger/stiffer than OEM. This allows for a higher level of performance. We are including our highest grade hardware and each control arm is CNC machined 6061 aluminum with an anodized ISC gold finish. Each control arm includes an engraving of our logo which creates a sharp look :-)! You can be sure that each control arm is easily adjustable and durable for a lifetime of hard cornering and suspension abuse. So What Makes ISCs Control Arms Different from the Rest?